MEDIA RELEASE PROVIDED BY BROCK UNIVERSITY AND CMS – Advancing their mandate to form long-term partnerships with world-class Ontario post-secondary institutions, Canadian Motor Speedway (CMS) has signed a Memorandum of Understanding with Brock University. The partnership will initially focus on research collaboration with the Faculty of Applied Health Sciences and could potentially develop into projects with the Environmental Sustainability Research Centre, BioLinc and The Goodman School of Business. Partnerships currently being considered involve students working with Sport Management Associate Professor Julie Stevens from the Faculty of Applied Health Sciences at Brock. University faculty and students would be working alongside CMS to research planned motorsport and entertainment events, and the economic impact those events might have on corporate sponsors, the Speedway, the Town of Fort Erie and the Niagara Region. “Right now the first step is economic. If you get some basic event information, you can go and find how many competitors and attendees those typically have and use those numbers to project what the economic impact would be on Niagara,” Stevens says. Officials from Brock and CMS gathered at the Speedway office in Fort Erie on Tuesday March 22 for the signing. Azhar Mohammad, CMS Partner and Executive Director, says the Speedway is proud of the opportunity to work with Brock’s Sport Management program. Clair MacSweyn, CMS Marketing and Sponsorship Executive and a Brock University alumna, says this particular research will be important to forming the Speedway’s calendar. 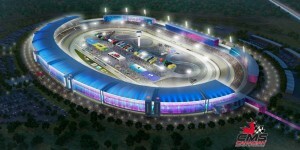 “As a multi-sports and entertainment venue, CMS will have a diverse year-round calendar of events. Collaboration in Sport Marketing and Sustainability in Sports will benefit Brock University research, CMS operations, sponsor engagement and the fan experience at CMS. As a Brock graduate, I am impressed with the expansion of the University over the years and the level of excitement in regards to participation in bringing Canada’s largest stadium and events to Niagara,” she says. 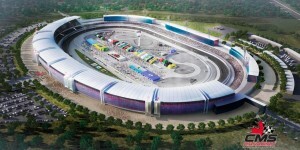 Brock University joins McMaster University’s Faculty of Engineering, Niagara College, and The University of Ontario Institute of Technology’s Automotive Centre of Excellence on Canadian Motor Speedway’s growing list of educational partners.